We sort of all knew this was coming and it's now finally here, the latest theme from Joomlashack. It's called Inspirion and is based on on the popular 960 grid system. The 960 grid promotes balance, consistency and usability. 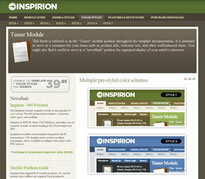 Inspirion is XHTML Strict, CSS/Tableless, and makes use of semantic Joomla! override headings (H1-H3) for improved SEO. You get everything you'd expect to get from one of the best Joomla theme providers and it's got loads of potential for development, regardless of the size of your site or need.